Air Deflector - Air Deflector with Filter Discounts Apply ! Floor register air deflectors are able to redirect air for a more comfortable living environment. 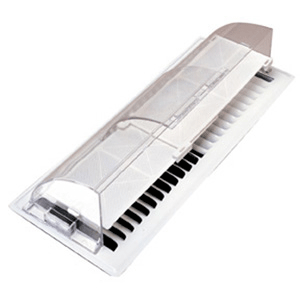 Redirect air vents also offer a filter for use to provide more breathable cleaner air. Floor register air deflectors are ideal for use with heating and cooling forced air systems. To install and redirect air vent deflectors no tools are needed, simply use the provided magnets. Floor register air deflectors are crafted with sturdy clear plastic and extend from 10" to 14" accommodating most floor registers. You can easily redirect air vent airflow with the placement of this filter deflector pointed in any direction that suits your needs. - Extend from 10" to 14"
***Note: Do not use the floor register air deflector on radiant heat registers. This floor vent air deflector can also be used in conjunction with the deflector sleeve extension to redirect air vents that are longer. Floor register air deflectors have a filter and redirect air vents towards a direction that offers you a more comfortable space, place your order today.